Diplomacy is usually the largest tournament at ManorCon, with typically 70 to 80 people entering. Each player plays one of the seven major powers in pre-war Europe. Each turn, the player will go off into a corner with each of the other players in turn, and talk about forming alliances, pacts, and generally agreeing as to what they will do to their mutual advantage. Then when the deadline is called, everybody returns to the board and secretly write orders for their units. Once everybody is finished, the orders are revealed and the units moved. Then everybody goes off in small groups again, and discusses why they didn't do what they say they would, how they can't really be blamed for not doing so, and how they will be much more trustworthy next time. 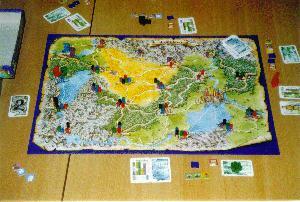 Since its release in 1961, Diplomacy has become one of the classic hobby boardgames. It has a large following in Europe, America and Australasia. The World Championships move around between these three continents, and regularly attract over 100 players, usually including a significant number who have travelled either the length of a continent, or intercontinentally to attend. Ever since it was first released, it has been played postally, with players negociating in writing rather than face to face, and with the coming of the internet, it's popularity is now growing rapidly, with several thousand players around the world playing by e-mail. The first E-Mail World Championships was held in 1999, with around 550 players competing. The Diplomacy Tournament at ManorCon is run over 3 rounds, with a players best two results counting. The rounds are Friday, 6pm-midnight, Saturday 9am-5.30pm and Sunday 9.30am-6.00pm. The Saturday round is also the team round, where players form teams of seven, with their total score in the Saturday round determining the teams result. New players are always welcome, although if you have not played the game before, your chances will be pretty much zero. Diplomacy is not a game where beginners luck will help you at all. However, you will be welcomed with open arms by pretty much all the players, mainly because they see you as an easy place for their gains to be made at your expense !!! If three games of Diplomacy in one weekend is not enough for you, you can also play someIntimate Diplomacy. 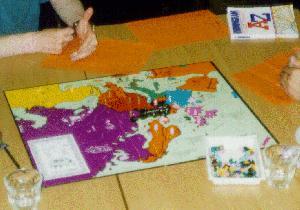 Most of the rules for the boardplay of Intimate Diplomacy are the same as those for Standard Diplomacy. 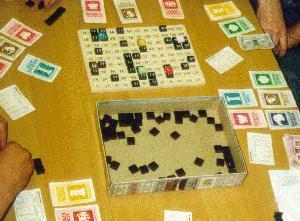 However, it is played with two players. Each player plays one of the seven standard powers, with the other five being mercenary. The players bid for which of these they will control for the next two turns, with the higher bidder writing orders for that country as well as his own. Games are much shorter than Standard Diplomacy. Experienced players will often complete a whole game within an hour. It is probably an idea to play a game or two of Standard Diplomacy before trying Intimate, just so you get the hang of writing orders with 4 or 5 units to look after, rather than 20 or more. However, once you can write orders reasonably well, Intimate Diplomacy is an excellent way to improve your tactics. 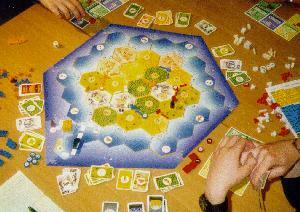 Die Siedler Von Catan, or Settlers as it is often known, has taken the gaming hobby by storm. It was first released in 1995. At the end of that year, it won the coverted "Spiel Des Jahres" (Game of the year) prize in Germany. 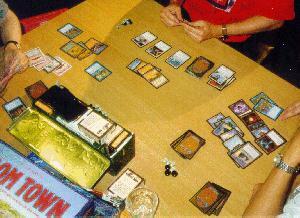 The first Settlers tournament at ManorCon was in 1996, when it was one of the most populour games. However a lot of people wrote it off as one of the many games that becomes populour for a year or two, and then disappears again. However, this has proved to not be the case. In 1997, the Settlers tournament became the first ever to have more players than the Diplomacy, an achievement it repeated in 1999. Settlers is a fairly simple game to learn. You are on an island of 19 hexagonal tiles of 5 different types - Wood, Brick, Grain, Sheep and Ore. On the corner of three hexes, you can build settlements, which then work the surrounding hexes, gaining the resources to build roads, more settlements, and to build settlements up into towns. First player to build up to a certain size wins. Of course, nobody ever manages to produce quite the combination of resources they want, but that is easily solved. Firsly you can always trade with the other players in the hope of helping them just that little bit less than you help yourself. Or if that doesn't work, you can always try to get control of the Robber, and just plain steal the resources you want off them. And if all else fails, you can always trade with the bank, although banks being what they are, will always want far more from you than they give back. Of course, when a game is as populour as Settlers is, there are always going to be followups. 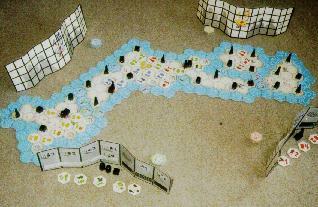 The Basic Expansion set allows you to play on a bigger island, with six players instead of four. The Seafairers Expansion replaces the one big island with several smaller islands, and allows you to build boats between them. And the Stad Und Ritter Expansion takes the game onto a whole new level, with far more levels of upgrading available. 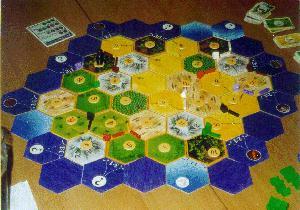 A standard game of Settlers takes up to 90 minutes to play. Some of the expansions take up to several hours. 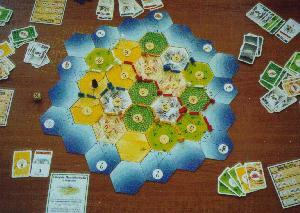 Beginners are pretty much always welcome to join in with a game of Settlers, although it is recommended that you play a game of the original basic version before trying to move on to the expansion sets. 18XX is the collective name for a whole stable of games based around the theme of making money from running railroads. Essentially, they are business games in which the players buy shares in the various railroad companies that are available, and attempt to run them for profit. 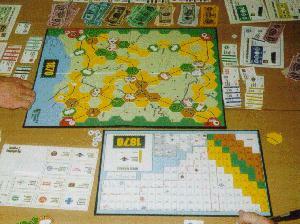 Each game consists of two interacting sub-games: one in which the players buy and sell shares in the railroad companies, and one in which the players run the railroad companies (this last involves building track, buying trains and running services). Like Diplomacy, 18XX games tend to be long (from 4 to 10 hours), but unlike Diplomacy, the rules are highly complex, and vary from game to game within the genre. Also like Diplomacy, the players get plenty of opportunities to financially embarrass their fellow players (in other words, get the knife in and give it a good twist!). The original 18XX was Francis Tresham’s 1829 South, set in southern England; this was published by Hartland Trefoil way back in 1973. In the late 1970’s, 1829 North was released, which covered northern England and Scotland. The 1980’s saw two more commercial releases, 1830 which is set in the north-eastern USA and eastern Canada, and 1853 which is set in India. Then, in the 1990’s, the floodgates were opened by the commercial release, in quick succession, of 1835 (set in Germany), 1856 (set in eastern Canada), and 1870 (set in the American mid-west). In addition to these commercial releases, various fanatical hobbyists started releasing game kits, and a veritable menagerie emerged including 1841 (set in northern Italy), 1837 (set in the Austro-Hungarian Empire), 1899 (set in northern China), 1876 (set in Trinidad), 1826 (set in France), 1851 (set in Kentucky and Tennessee), and many more. If you like your games short, then 18XX is not for you. However, if you like your games long and complex, with lots to think about and mull over, then this could be the game system for you. The beginner is advised to avoid the more financially cut-throat versions, like 1830 and 1841, and to start off on some of the more gentle versions like 1851, 1837 or 1835. For more information, contact Chris Lawson (who maintains a web page devoted to 18XX called Blackwater Station) or Steve Thomas. Acquire is one of the older games to be played at ManorCon. 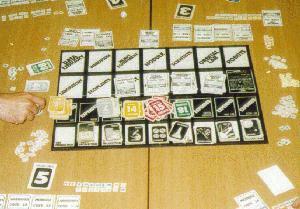 The players form chains of hotels on the board, and then buy shares in them. As the chains expand, their value increases. Eventually takeovers start to occur, with the larger chains swallowing up the smaller ones. When this happens, the shareholders in the smaller chains are bought out, with a nice little cash bonus going to the two largest shareholders. Of course, their are new chains appearing all the time, a few of which grow to be large, but most get swallowed up by the large chains before they have a chance. Eventually the hotel market becomes saturated, at which point the players count up their money and the value of their shares, with the player with the highest value winning. A game of Acquire will last a little over an hour. Learning will only take a few minutes, and most people will be more than happy to teach a new player. This is a game of economic development. Each player commands a space colony consisting of a small population operating factories producing various commodities. Production from the factories is used to pay for expansion of the colony in various ways. The obvious initial development is to buy more factories and more people to operate them. This easy expansion rapidly comes to an end as the colony soon reaches its population limit. Furthermore the colony has finite storage space so production cannot be stockpiled indefinitely. The players must now attempt to upgrade their colonies to enable further economic growth. The main early upgrades expand population capacity, add extra storage space or permit factories producing a more valuable commodity to be built. These colony upgrades are sent randomly from Earth, are only available in limited quantities and are sold by auction. The colony commanders must decide not only how they want to develop their colonies, but also how much they are willing to pay for the privilege. As the colonies develop, so Earth sends better and more expensive upgrades. The players must continually find an expansion path for their colonies. Buying upgrades too soon delays production growth, but leaving it too late can mean being outbid by other players. Players can also attempt to hamper the development of other colonies. If another colony appears to need a particular upgrade, just how high can you push the price in the auction even though it's obvious that you neither need it nor want it? Eventually someone's colony becomes sufficiently developed that the game ends. At this stage (and indeed through most of the game) it is customary for all players, even the winner, to complain about their bad luck. Not only will everyone have had below average production from their factories (much as all bridge players have below average point counts), but also the colony upgrades will of course have come available in just the wrong order. Outpost is a game for 2-10 players, but most games at Manorcon involve 4-7 players, partly because the Tournament excludes games involving only 2 or 3 players. Game length depends on the number of players, but is typically 2-3 hours. The rules are not unduly complex, though understanding the various strategies takes more time. A victory by a complete novices is not impossible provided the player is willing to take advice from the more experienced players. Often they will put so much effort into sabotaging each other's plans that they will realise the strength of the novice's position too late to counter it. Being in the middle of July, ManorCon has a habit of picking one of the best weekends of the year, weatherwise. It can often seem a shame to stay inside for the whole weekend playing games. This is where the Croquet Tournament comes in. Usually a 16 player, 4 round knockout tournament, it is played on the area of grass outside the main hall that some people pretend is flat enough to be called a croquet lawn. Games are played whenever the two players are both free, which can often mean that people decide to take advantage of the warm evenings, and play well after darkness has fallen, and sometimes games can be seen being played well after midnight, by the light that escapes out of the main gaming hall windows. If you want to play in the Croquet tournament, you need to talk to Steve Jones, who will slot you into the tournament (if there is still space). 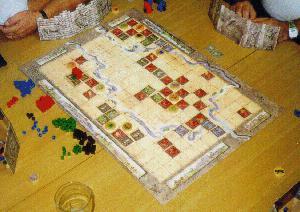 Tigrus and Euphrates is another recent German Game. Players take it in turns to either place leaders on the board, or to place tiles to build up the empires around their leader. From time to time, either a leader tries to invade an empire where there is already an opposing leader, or two empires become connected, each of which has leaders which conflict with those in the other empire. In either case a fight breaks out, with one leader the victor, and the other being removed from the board, often partially collapsing the empire in the process. An ingenious scoring system is used to reward players for building empires, winning fights, and later on, building monuments, and with everybody's score being secret until the end, the winner is often not known until the final count up at the end of the game. A game of Tigrus and Euphrates takes around 2 hours, although this can vary significantly, depending on the players involved. Beginners will take about 15 minutes to be taught the rules before they start, but will probably take a complete game before they really know what is going on. After two or three games, most players feel they know how the game works, but are still guessing what is a good move and what is not. After several more games, they realise that this feeling does not go away. Very few players can play this game by tactical analysis. 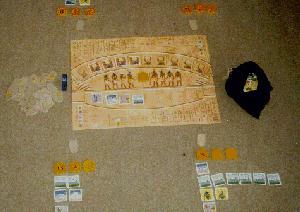 This is another game by Reina Knitza, the author of Tigrus and Euphrates. When it was released, it was hailed as being as good as Tigrus and Euphrates. However, it never took off in quite the same way. Despite being a completely different game to Tigrus and Euphrates, it has several of the same Knitza hallmarks. The tactics are very deep, and hard to mentally analyse, although the rules are pretty simple - much simpler than Tigrus and Euphrates. And the scoring system is like no other game you will ever play. 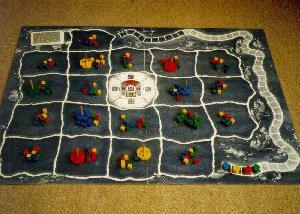 A game of Samurai will last about 40 minutes, and a new player should be able to learn the rules in 5 minutes. New players should be able to play reasonably well from their first game, although it will probably take several games before they have much chance of winning a game. Ra is yet another game by Reina Knitza. Players draw egyptian tiles out of a bag in turn, and when either they or the gods think it is worth doing, there is an auction. The players use the various strength suns which the gods gave them to bid for the tiles, with the highest bidder taking them. After each epoch of auctions, the tiles each player has collected are scored up, each tile type having a different method of scoring, and then the next epoch starts. Highest score at the end wins. A game lasts around an hour, and a new player should be able to play with very little introduction. However, it will take a few games before they get the feel for the value of a given set of tiles. Elfenlands is all about elfs racing around their land, trying to visit as many towns as possible, and then get home again, within the length of the game. Being elves, they have various means of getting between towns, from elvencycles to flying on dragons to rafting down the rivers. Each elf has to try and plan out their route, and then execute it, while also trying to hinder the other elves in the process. The game usually lasts around 90 minutes, although this is often longer as the game tends to encourage comment, humour, etc, rather than heads-down play. Beginners can pick the game up pretty quickly, and there is enough luck in the game that they stand a chance of winning even in their first game, although there is also enough skill that this is not too likely. Magic is a game that either you love or you loathe. Each player is a wizard, They has a deck of cards containing various elements required to cast spells in order to try and beat the other. However, the decks are not standard. Instead, each player buys packs of cards, and mixes them together in order to make what he considers to be a good deck. Some cards are pretty common, others are fairly rare. Because of this, there is a significant market for the better cards, with some of them selling for several hundred pounds per card. Magic is not a game you can just give a go easily, as you need your own deck of Magic cards in order to play. Svea Rike is a historical game based on Sweden between the 16th and 19th Centuries. It was released in 1997, when it won the Swedish game of the year award. Each player represents a noble family, and you win by gaining more status (or victory) points than anyone else; status can be accrued by accumulating land (by ownership of fiefs), gold (by sending out merchants), and fame (by patronising historical personages and/or institutions). Visually, the game looks wonderful: the game board shows a map of Sweden subdivided into its constituent provinces (or fiefs), which has a period look to it, and contains spaces for placing the various decks of cards used in the game. Around the edge of the board is a turn track for the 16 turns of the game; each turn represents a reign of the historical Kings and Queens of Sweden during this period of history (complete with a picture of the monarch concerned). The game is driven by cards, of which there are four types. A deck of 24 Royal cards determine what kind of reign the current game turn will be, either some type of Peace, or War! The fief cards are used to indicate the characteristics of the 24 fiefs, both domestic and foreign, in the game. The three decks of History cards, one for each of the three different eras in the game, consist of six patronage series (cultural personalities, military, palaces, queens, scientists, and resources), the first five of which are collectible series for status points purposes. A deck of 70 Event cards is a draw pile from which players draw from time to time during the course of the game; these event cards introduce a great deal of randomness and chaos into the game, largely because most of them can be played at any time. Each reign starts with the draw of a Royal card, and if there is no War, each player has his individual turn in a randomly determined sequence. During his turn, a player can choose to do one of three things: expand his land holdings, increase the number of his merchants, or purchase History cards. However, if there is a War, the players band together to form the Swedish army and attempt to obtain war booty. Svea Rike is relatively easy to grasp, despite its appearance of complexity. 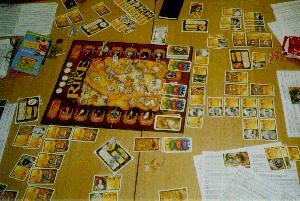 A game typically lasts about 3 hours, provided an English translation of the rules and all the cards is available. Some players dislike the game, saying that the Event cards introduce too much randomness, and can be too devastating at times. However, if you approach the game philosophically and allow for the chaos in your general play, it can be very enjoyable, win or lose. Overall, it is an excellent game, with lots of player interaction, and the game mechanics ooze historical flavour and a sense of the period. 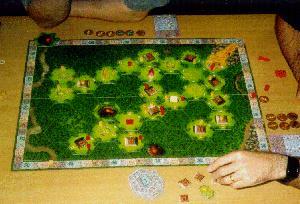 Tikal is the winner of the coveted "Spiel Des Jahres" (Game of the Year) prize in Germany for 1999. It is a game based around the theme of excavating Mayan ruins in the central American jungle. So, if you’ve ever had a hankering to be an Indiana Jones, this is your chance! Tikal is a fairly easy game to learn. The board consists of a largely unexplored jungle with a hexagonal grid of 40 spaces, of which only 4 are already explored; somewhere within this jungle are fabulous temples and precious treasure which you are racing other expeditions to locate and gain control of. The game also contains 36 hexagonal terrain tiles subdivided into 10 temple hexagons, 8 treasure hexagons, 15 clear terrain hexagons and 3 volcano hexagons; these are shuffled within 7 letter coded sets to provide a limited degree of randomness as the jungle is explored. Each turn, 4 of the hexagons are turned up and the players bid for turn order, and during your turn, you select a hexagon and place it adjacent to already explored terrain, and expend 10 action points. These action points enable you to excavate temples, dig for treasure, steal (well, exchange) treasure with other players, establish base camps, and take control of temples. Scoring occurs four times during the game: each time a volcano hexagon is placed, and at the end of the game. Scoring is relatively straight-forward: the value of each temple you control plus the value of any treasure you have found. The trick to scoring well is to convert any treasure collection you have into sets of artifacts (either doubles or triples), and to gain control of as many high-value temples as possible. The fact that the other players are attempting to do the same results in a highly competitive game which is both fun and enjoyable to play. Expect playing time to be 2-3 hours, although this can be reduced to 2 or less if one plays to a variant scoring system whereby scoring occurs as soon as a volcano hexagon is laid (this variant makes what is an average game into a great one). Ursuppe is probably one of the most original ideas for a game. Each player controls a herd of amoeba ! They float around in the Primevil soup, trying to eat and excrete. And as they do so, they collect biological points. These can be used for two things. Firstly, they can multiply, and increase the size of the Amoeba herd. Secondly, they can develop new genes, allowing them to do anything from moving around the soup more freely to get to food, to fighting other amoeba, to developing intelligence (which is completely useless - what would an amoeba do with intelligence ?). Each turn, each player is scored for his progress at both growing and developing his herd, with the first player to reach the end of the scoretrack the winner. Ursuppe takes at least two and a half hours. However, because it starts off as a pretty simple game, only getting more complex as the various genes are developed, it is ideal for beginners, who can pick the game up pretty much as they go along. p.s. Is herd really the correct collective noun for Amoeba ?